"How Washington unleashed fossil-fuel exports and sold out on climate" was first published by The Texas Tribune, a nonprofit, nonpartisan media organization that informs Texans — and engages with them — about public policy, politics, government and statewide issues. Leading the charge within government was then-Energy Secretary Ernest Moniz, a nuclear physicist with longstanding ties to the oil and gas industry and an enthusiastic proponent of natural gas. Under his watch, the Energy Department moved swiftly to foster LNG exports in 2013 before shifting its focus to decades old restrictions on the export of crude oil. Days after the Paris climate agreement was reached in 2015, Obama signed a budget bill to keep the federal government running; slipped inside was a provision allowing crude oil to be sold freely for the first time since 1975. The move was praised by an alliance of 16 companies, most of which are now capitalizing on an export-driven boom in the Permian Basin of West Texas and southeastern New Mexico. By 2016, a new global market connected U.S. drilling rigs with refineries in China and LNG terminals in the United Kingdom. A portrait of Moniz with his distinctive “Founding Fathers” coif hangs in a corridor next to Perry’s office at the Energy Department. Details in the oil painting highlight the former energy secretary’s achievements, among them a landmark study of natural gas from his days at the Massachusetts Institute of Technology and a copy of the Iran nuclear agreement — a disarmament plan he helped negotiate in 2015. That same year, Moniz also played a pivotal role in the Paris accord, which set global commitments to mitigate climate change. The fate of both deals is unclear. In 2017, Trump announced that the U.S. would withdraw from the Paris accord, calling it a job-killer. This May, he abandoned the Iran deal, making good on a campaign promise. The future of natural gas, however, remains bright. As Obama’s energy czar, Moniz spearheaded the administration’s “all-of-the-above” policy, which endorsed drilling alongside renewable energy. When he became secretary in 2013, among his top priorities was fast-tracking approvals for natural-gas exports — as advocated by industry lobbying groups such as the American Petroleum Institute as well as pro-export studies published by think tanks such as the Brookings Institution and the Center for Strategic and International Studies. The Trump White House has taken the idea a step further, ardently supporting fossil fuels. In August, the Energy Department announced it would automatically approve small-volume exports of LNG. Before U.S. Environmental Protection Agency Administrator Scott Pruitt resigned amid multiple scandals, he was criticized for meeting regularly with industry executives and lobbyists and promoting American natural gas during a trip to Morocco. Interior Secretary Ryan Zinke, a booster of increased drilling on federal lands and offshore, has called America’s energy supremacy a moral imperative. Former Obama officials, including Moniz, have positioned themselves as climate stalwarts in opposition to Trump — despite their own history of ties to the oil and gas industry. Working with free-market academics and think tanks while Obama was president, they formed an echo chamber pushing fossil-fuel exports, often with industry-funded studies. The results exceeded even the most bullish economic forecasts: in the past three years, exports of crude oil have shot up four-fold and exports of LNG 35-fold, according to the U.S. Energy Information Administration. Moniz now runs two companies from the same office near the White House — a nonprofit think tank, Energy Futures Initiatives, and a for-profit firm, EJM Associates LLC. While EFI promises “unbiased policy options to advance a cleaner, safer, more affordable and more secure energy future,” EJM provides “strategic consulting” for unnamed energy clients and trade organizations. The two organizations were launched on the same day last year. EJM receives staff and administrative support from EFI. Both share an office suite with The Scowcroft Group, a consultancy founded by former National Security Advisor Brent Scowcroft that specializes in emerging markets such as China and whose clients include oil and gas companies. Scowcroft and Moniz aren’t just office mates. According to their websites, their for-profit firms are engaged in a three-way partnership with McLarty Associates, a trade consultancy located in the same building. A press release describes EJM as strategic energy advisor for McLarty Associates clients. Headed by Thomas F. “Mack” McLarty III, a Clinton White House chief of staff and former natural-gas executive, the firm has represented LNG investors Chevron and General Electric. McLarty’s lobbying division has advocated for Shell on natural-gas matters and a company behind a pipeline with ties to the Kremlin. Brent Scowcroft and Mack McLarty sit on EFI’s advisory board. Responding to follow-up questions, a spokesman wrote in a seven-page statement that Moniz “has no financial relationships with oil and gas producers,” and that neither EFI nor EJM engages in “lobbying activities or foreign government representation.” It also said, “EJM has had no discussions with McLarty on LNG export issues,” but did not include a similar qualification for The Scowcroft Group. “To date, there are no joint projects with either [Scowcroft or McLarty],” the statement said. Representatives of Scowcroft and McLarty declined to comment. EFI does not disclose its sponsors, but its statement said it receives funding from foundations, corporations, nonprofits and individuals. Only 17 months old, EFI has become an authority on climate change. The nonprofit announced in September it plans to study technologies to remove carbon dioxide from the atmosphere. Moniz himself is working on low-carbon energy solutions as a distinguished fellow for the Emerson Collective, an organization headed by the widow of the late tech icon Steve Jobs. At the same time, Moniz sits on the board of Southern Company, a utility that is investing in natural gas for power generation and has been criticized for fostering skepticism of climate change. Moniz’s oil and gas ties go back years. When named as energy secretary, he terminated his work as a paid consultant for several companies, including BP, General Electric and Riverstone Equity Holdings LP, a major fossil-fuel investor, as well as for a Saudi Arabian think tank. He also stepped down from the board of, and sold his stock in, ICF International Inc., a consulting firm hired by the American Petroleum Institute to study the economic benefits of LNG exports. At MIT, Moniz ran a think tank, largely funded by the oil and gas industry, which published one of the earliest and most influential reports on natural gas. First publicized in interim form in June 2010, “The Future of Natural Gas” affirmed the fuel as a “bridge” to ease the country’s transition from coal and argued against policies that could dampen its rise. The study’s major sponsor was the American Clean Skies Foundation, a group created by Aubrey McClendon — then CEO of Chesapeake Energy — as part of a multimillion-dollar effort to market natural gas as a climate solution. The study’s advisory board included energy bigwigs such as McLarty and John Hess of Hess Corporation, an oil and gas company. The Public Accountability Initiative, which describes itself as a nonpartisan corporate and government watchdog, criticized the study in a 2013 report. The group blasted Moniz and other co-authors for not fully disclosing their industry connections and lending “academic credibility to industry talking points” by minimizing the drawbacks of fracking. At the time, both Moniz and the White House declined to comment publicly on the issue. Moniz and several co-authors aggressively promoted the interim report in Washington with a press conference, congressional briefings and closed-door meetings at the Energy Department and the President’s Council on Environmental Quality. White House records show Moniz met with key Obama climate advisors in the weeks before and after the report was published. When a final version of the study was released in 2011, Moniz spoke about it at a press conference at the Brookings Institution in Washington, which had convened a task force to explore LNG exports just a month earlier. Task force members included two staff members from Moniz’s MIT group. After leaving his White House job in 2013, Obama climate advisor Jason Bordoff also joined the Brookings task force. In his statement to the Center, Moniz’s spokesman said the study has “stood the test of time.” The spokesman emphasized Moniz’s support for an Obama-era rule that sought to rein in leaks of methane from oil and gas sites — a regulation the Trump administration says it plans to weaken. The MIT study was cited in a slew of other reports, including one from an Energy Department committee in 2011 that concluded shale gas would “provide economic and environmental benefits” as well as strengthen national security. Chairing the committee was John Deutch, a former CIA director and then-board member of Cheniere, a Houston-based company that later became the first to export LNG. As it happened, Deutch was also one of 30 MIT researchers who co-authored Moniz’s natural-gas study. Deutch was among six of the seven Energy Department committee members with potential conflicts of interest. Another member, Pulitzer Prize-winning author Daniel Yergin, went on to publish several studies in favor of LNG and crude-oil exports as vice chairman of IHS Markit, a leading industry consultancy in Cambridge, Massachusetts. Yergin sat on the advisory board of Moniz’s MIT think tank; Moniz was a private consultant for IHS Markit. Deutch did not respond to requests for comment, but a representative of Yergin’s noted that IHS is “solely responsible” for the contents of its studies, regardless of funding. To meet the lofty targets outlined in the Paris agreement, it is widely accepted that countries must reach “zero emissions” by 2050, which means phasing out fossil fuels or developing technologies that make them climate-neutral. Environmentalists argue the expansive buildout of natural-gas infrastructure ensures the fuel’s future for decades, jeopardizing the world’s chances of avoiding catastrophic warming. At present, renewable energy sources make up less than one-fifth of U.S. power generation. Despite these concerns, LNG’s popularity has only grown. An official day celebrating natural gas was held during the 2016 G20 summit in Beijing, where world leaders were urged to “differentiate natural gas from other fossil fuels with effective and favourable policies.” Amid Trump’s escalating trade war, Chinese officials enacted lower retaliatory tariffs on imports of American LNG than they originally threatened — signifying how crucial the fuel is to China’s growth as it curbs its reliance on coal. During a July press conference in England with British Prime Minister Theresa May, Trump struck an upbeat tone. “We've become an oil exporter, which would not have happened under the past regime or a new regime if it weren't us,” he declared. Congress had enacted restrictions on crude exports as a conservation measure in 1975 following the Arab Oil Embargo, which caused fuel shortages that led to skyrocketing prices at the pump. Under the ban, companies had to refine crude oil into petroleum products such as gasoline or secure special exemptions from the Commerce Department to sell the resource abroad. As was the case with LNG, interest in crude-oil exports soared when fracking took off. With oil production rising steadily in 2012, American Petroleum Institute President Jack Gerard was among the first to suggest the ban be thrown out. Shortly thereafter, crude-oil exports became a priority for the GOP as well as some Democrats in drilling states. Sens. Heidi Heitkamp, D-N.D., and Lisa Murkowski, R-Alaska, responded by mustering congressional support for a provision in that year’s budget bill allowing crude-oil exports. By December 2015, the measure was part of a $1.1 trillion spending plan — veto-proof legislation needed to keep the federal government running. In exchange for backing exports, Democrats got five-year extensions on tax credits for wind and solar. Climate change was an afterthought in the debate over the ban, Cohen said. Both sides were fixated on how crude-oil exports would affect energy prices, not greenhouse-gas emissions. Experts wrongly predicted exports would amount to “a trickle, not a flood.” And Democrats mistakenly banked on pollution-cutting policies such as the Clean Power Plan — one of several Obama-era regulations being tossed out by Trump — to drive investment in renewable energy. On January 4, 2016, ConocoPhillips — one of 16 companies that collaborated to overturn the ban — became the first to export American crude oil, sending a shipment from the Texas Gulf Coast to a trading hub in southern France. This summer, the U.S. shattered records by exporting 3 million barrels of crude a day, trailing only Saudi Arabia and Iraq. In a written statement, Heitkamp said crude-oil exports have allowed the U.S. to “level the playing field in the global energy market” and made “sure our allies get energy resources from us instead of volatile regions.” Obama representatives did not respond to requests for comment. Moniz was among the first Obama administration officials to publicly question the ban in December 2013. During an industry conference at New York’s Waldorf Astoria hotel, Moniz suggested it was time to rethink the outdated policy. Executives at ExxonMobil, ConocoPhillips and Shell agreed, fueling an industry campaign to cast the ban as a relic of the 1970s. In the interview with the Center and Newsy, Moniz said his remarks reflected “proper policy,” not industry lobbying. Barriers to exports already had been eroding behind the scenes. In September 2013, the Commerce Department issued a confidential ruling allowing Houston-based Peaker Energy to export condensate, a barely processed, ultralight oil hard to distinguish from crude. The agency granted approvals to two more companies in March 2014. The rulings — which didn’t become public knowledge until months after they were issued — triggered speculation by an energy analyst that Commerce was taking a “baby step” toward lifting the ban. It was unclear at the time what differentiated condensate from crude, but the distinction potentially was worth billions of dollars to drillers looking to export oil. At the same time, a flurry of white papers promised crude-oil exports not only would lower energy prices but also give America an edge over energy titans such as Russia. In January 2014, Murkowski sent then-Commerce Secretary Penny Pritzker a letter asking her to weigh in, enclosing a staff report suggesting the agency could “lift the ban on its own.” A separate study from IHS Markit argued that reversing the ban would resolve a dilemma created by the fracking boom, which had flooded the market with a lighter crude that couldn’t be easily processed by most U.S. refineries. Co-authored by Yergin, that report was funded by 20 oil and gas companies. Exports have taken drilling to new heights in the Permian Basin. Of PACE’s 16 members, at least 14 were active in the region last year. The basin’s top two producers were PACE companies Pioneer Natural Resources and Occidental Petroleum, which collectively earned more than $2 billion in profits in 2017. Some of the same PACE companies fund Columbia University’s Center on Global Energy Policy, a think tank founded in 2013 by former Obama energy and climate advisor Jason Bordoff, who has argued in favor of both LNG and crude-oil exports as a way to spur job growth and keep America competitive. Columbia previously housed a similar think tank called the Center for Energy, Marine Transportation and Public Policy (CEMTPP), which was launched in 2000 with $3 million from ExxonMobil and a foundation created by shipping magnate Aristotle Onassis. CEMTPP was headed by a Mobil lawyer before it was dissolved sometime in 2014. Tax filings for its foundation were registered at Mobil’s old campus in Fairfax, Virginia. In an email, a Columbia spokesman said there is no connection between Bordoff’s Center on Global Energy Policy and CEMTPP. “At no point has there been a relationship between the two organizations or their personnel,” the spokesman wrote. ExxonMobil also funds Bordoff’s center but is not among its top donors. Of the 48 sponsors listed on the center’s website, at least 29 have direct ties to the oil and gas industry. Donors include foreign investors such as Tokyo Gas Company Ltd., a Japanese utility that recently signed a 20-year contract to import U.S. LNG, and Wall Street firms such as Perella Weinberg Partners, a hedge fund that reported a multimillion-dollar stake in LNG startup Tellurian earlier this year. The center’s advisory board includes Yergin; one current and one former executive from ConocoPhillips; Chinese oil tycoon Fu Chengyu; and Charif Souki, co-founder of LNG companies Cheniere and Tellurian. The board’s industry-heavy makeup has drawn scrutiny from advocacy organizations such as Public Citizen and the Environmental Working Group, which demanded the center disclose its funders in 2015. The center began posting a list of sponsors online earlier this year. Only a handful of donors — among them Bloomberg Philanthropies and ClimateWorks Foundation — appear to be focused on climate change and renewable energy. Funding sources are rarely disclosed in the center’s papers or Bordoff’s numerous op-eds and columns. In 2015, Bordoff promoted a paper supporting crude-oil exports to high-ranking Commerce staffers. Though the report was among the few to conclude that exporting crude would likely increase carbon emissions, it argued that climate change would be better addressed in other ways. Bordoff has been a frequent critic of the Trump administration for its rollbacks of environmental regulations. “Neutering the Clean Power Plan is a major step backward,” he wrote in The New York Times in August. But he’s continued to advocate for LNG exports, aligning himself with free-market diehards like Perry. For all their bluster, Perry and other Trump officials are merely capitalizing on choices made years earlier that breathed new life into “vested fossil-fuel interests,” said Slocum, of Public Citizen. Disclosure: ExxonMobil, BP America and the Environmental Defense Fund have been financial supporters of The Texas Tribune, a nonprofit, nonpartisan news organization that is funded in part by donations from members, foundations and corporate sponsors. Financial supporters play no role in the Tribune's journalism. Find a complete list of them here. How Washington unleashed fossil-fuel exports and sold out on climate By Jie Jenny Zou, Center for Public Integrity October 16, 2018 WASHINGTON — Energy Secretary Rick Perry’s keynote speech at the World Gas Conference in June opened with a marching band and ended with an exhibition by the Harlem Globetrotters. It was a spectacle befitting the industry symposium, which kicked off with a reception featuring a violinist perched on a pedestal in a 20-foot-long dress and trumpeters bearing ExxonMobil and ConocoPhillips banners on their instruments. “We’re sharing our energy bounty with the world,” Perry gushed from a stage at the Washington Convention Center. “I wish I could tell you the entire world is on board. There is still this stubborn opposition to natural gas and other fossil fuels.” Long undervalued, natural gas was once burned off indiscriminately as an unwanted byproduct of oil drilling. But the fuel’s fortunes have changed. Cooled to minus 162 degrees Celsius, natural gas condenses into a liquid marketed as a clean alternative to coal. In just three years, the U.S. has emerged as a top producer of liquefied natural gas, or LNG, selling shiploads of the commodity to countries such as China, which are seeking low-carbon energy sources to combat climate change. Loading... Natural gas, it turns out, isn’t so great for the climate, but that hasn’t stopped America from sending its fossil fuels abroad. Since Donald Trump took office in 2017, exports of LNG and crude oil have surged, rivaling the likes of Saudi Arabia and Russia. To achieve what it calls “energy dominance,” the Trump administration has taken its cues from an unlikely source: its predecessor. When Perry hawked LNG and coal to India in April, he was advancing a dialogue the Department of Energy began under Barack Obama in 2014. That same month, Vice President Mike Pence pledged to work with the Japanese government to bring LNG to Asia — building on a partnership that began in 2013. Leaked administration plans for a “central institution” to promote “clean and advanced fossil fuels” abroad could combine several Obama-era initiatives. Compared to Trump, Obama is regarded as an environmental champion. But history paints a more complicated picture. As the young senator promised “change we can believe in” during the 2008 presidential campaign, change was also sweeping American oilfields. Advances in hydraulic fracturing, or fracking — a way of recovering oil and gas from tight rock called shale — created a glut. Industry responded by pitching fossil-fuel exports as a “win-win” that would benefit consumers and enhance American power. Helping to deliver the message was a coalition of White House advisers: academics such as Columbia University’s Jason Bordoff, energy gurus such as Daniel Yergin, and national-security experts such as John Deutch — all with links to firms profiting from the boom. Leading the charge within government was then-Energy Secretary Ernest Moniz, a nuclear physicist with longstanding ties to the oil and gas industry and an enthusiastic proponent of natural gas. Under his watch, the Energy Department moved swiftly to foster LNG exports in 2013 before shifting its focus to decades old restrictions on the export of crude oil. Days after the Paris climate agreement was reached in 2015, Obama signed a budget bill to keep the federal government running; slipped inside was a provision allowing crude oil to be sold freely for the first time since 1975. The move was praised by an alliance of 16 companies, most of which are now capitalizing on an export-driven boom in the Permian Basin of West Texas and southeastern New Mexico. By 2016, a new global market connected U.S. drilling rigs with refineries in China and LNG terminals in the United Kingdom. What’s good for corporate profits, however, may not be good for the planet. A growing body of research suggests natural gas isn’t the climate panacea many promised it would be, with mounting concerns over its main component: methane, a greenhouse gas roughly 86 times more potent in the short term than carbon dioxide. In the race for energy supremacy, the U.S. has become not only the world’s largest natural-gas producer but also a top exporter of oil — a fuel that remains among the most harmful for the climate and public health. As energy exports climb, so too does global consumption of fossil fuels, drawing billions in infrastructure investment that — some argue — tilts the world away from renewable sources of energy such as wind and solar. 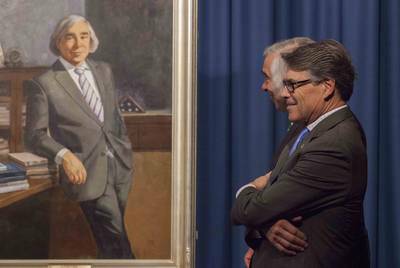 On August 2, 2017, U.S. Energy Secretary Rick Perry presided over the unveiling of an oil portrait of his predecessor, Ernest Moniz. The painting highlights some of Moniz’s published work, including a seminal study, “The Future of Natural Gas.” Simon Edelman/U.S. Department of Energy ‘All of the above’ A portrait of Moniz with his distinctive “Founding Fathers” coif hangs in a corridor next to Perry’s office at the Energy Department. Details in the oil painting highlight the former energy secretary’s achievements, among them a landmark study of natural gas from his days at the Massachusetts Institute of Technology and a copy of the Iran nuclear agreement — a disarmament plan he helped negotiate in 2015. That same year, Moniz also played a pivotal role in the Paris accord, which set global commitments to mitigate climate change. The fate of both deals is unclear. In 2017, Trump announced that the U.S. would withdraw from the Paris accord, calling it a job-killer. This May, he abandoned the Iran deal, making good on a campaign promise. The future of natural gas, however, remains bright. As Obama’s energy czar, Moniz spearheaded the administration’s “all-of-the-above” policy, which endorsed drilling alongside renewable energy. When he became secretary in 2013, among his top priorities was fast-tracking approvals for natural-gas exports — as advocated by industry lobbying groups such as the American Petroleum Institute as well as pro-export studies published by think tanks such as the Brookings Institution and the Center for Strategic and International Studies. The Trump White House has taken the idea a step further, ardently supporting fossil fuels. In August, the Energy Department announced it would automatically approve small-volume exports of LNG. Before U.S. Environmental Protection Agency Administrator Scott Pruitt resigned amid multiple scandals, he was criticized for meeting regularly with industry executives and lobbyists and promoting American natural gas during a trip to Morocco. Interior Secretary Ryan Zinke, a booster of increased drilling on federal lands and offshore, has called America’s energy supremacy a moral imperative. Former Obama officials, including Moniz, have positioned themselves as climate stalwarts in opposition to Trump — despite their own history of ties to the oil and gas industry. Working with free-market academics and think tanks while Obama was president, they formed an echo chamber pushing fossil-fuel exports, often with industry-funded studies. The results exceeded even the most bullish economic forecasts: in the past three years, exports of crude oil have shot up four-fold and exports of LNG 35-fold, according to the U.S. Energy Information Administration. Moniz now runs two companies from the same office near the White House — a nonprofit think tank, Energy Futures Initiatives, and a for-profit firm, EJM Associates LLC. While EFI promises “unbiased policy options to advance a cleaner, safer, more affordable and more secure energy future,” EJM provides “strategic consulting” for unnamed energy clients and trade organizations. The two organizations were launched on the same day last year. EJM receives staff and administrative support from EFI. Both share an office suite with The Scowcroft Group, a consultancy founded by former National Security Advisor Brent Scowcroft that specializes in emerging markets such as China and whose clients include oil and gas companies. Scowcroft and Moniz aren’t just office mates. According to their websites, their for-profit firms are engaged in a three-way partnership with McLarty Associates, a trade consultancy located in the same building. A press release describes EJM as strategic energy advisor for McLarty Associates clients. Headed by Thomas F. “Mack” McLarty III, a Clinton White House chief of staff and former natural-gas executive, the firm has represented LNG investors Chevron and General Electric. McLarty’s lobbying division has advocated for Shell on natural-gas matters and a company behind a pipeline with ties to the Kremlin. Brent Scowcroft and Mack McLarty sit on EFI’s advisory board. During a recent interview with the Center for Public Integrity and Newsy, Moniz balked at the suggestion that his ties to the fossil-fuel industry could pose a conflict of interest. He stood by natural gas as a cleaner-burning fuel than coal, noting its public-health benefits, and added, “I have been a champion of renewables for a long, long time.” Responding to follow-up questions, a spokesman wrote in a seven-page statement that Moniz “has no financial relationships with oil and gas producers,” and that neither EFI nor EJM engages in “lobbying activities or foreign government representation.” It also said, “EJM has had no discussions with McLarty on LNG export issues,” but did not include a similar qualification for The Scowcroft Group. “To date, there are no joint projects with either [Scowcroft or McLarty],” the statement said. Representatives of Scowcroft and McLarty declined to comment. EFI does not disclose its sponsors, but its statement said it receives funding from foundations, corporations, nonprofits and individuals. Only 17 months old, EFI has become an authority on climate change. The nonprofit announced in September it plans to study technologies to remove carbon dioxide from the atmosphere. Moniz himself is working on low-carbon energy solutions as a distinguished fellow for the Emerson Collective, an organization headed by the widow of the late tech icon Steve Jobs. At the same time, Moniz sits on the board of Southern Company, a utility that is investing in natural gas for power generation and has been criticized for fostering skepticism of climate change. Moniz’s oil and gas ties go back years. When named as energy secretary, he terminated his work as a paid consultant for several companies, including BP, General Electric and Riverstone Equity Holdings LP, a major fossil-fuel investor, as well as for a Saudi Arabian think tank. He also stepped down from the board of, and sold his stock in, ICF International Inc., a consulting firm hired by the American Petroleum Institute to study the economic benefits of LNG exports. At MIT, Moniz ran a think tank, largely funded by the oil and gas industry, which published one of the earliest and most influential reports on natural gas. First publicized in interim form in June 2010, “The Future of Natural Gas” affirmed the fuel as a “bridge” to ease the country’s transition from coal and argued against policies that could dampen its rise. The study’s major sponsor was the American Clean Skies Foundation, a group created by Aubrey McClendon — then CEO of Chesapeake Energy — as part of a multimillion-dollar effort to market natural gas as a climate solution. The study’s advisory board included energy bigwigs such as McLarty and John Hess of Hess Corporation, an oil and gas company. The Public Accountability Initiative, which describes itself as a nonpartisan corporate and government watchdog, criticized the study in a 2013 report. The group blasted Moniz and other co-authors for not fully disclosing their industry connections and lending “academic credibility to industry talking points” by minimizing the drawbacks of fracking. At the time, both Moniz and the White House declined to comment publicly on the issue. Moniz and several co-authors aggressively promoted the interim report in Washington with a press conference, congressional briefings and closed-door meetings at the Energy Department and the President’s Council on Environmental Quality. White House records show Moniz met with key Obama climate advisors in the weeks before and after the report was published. When a final version of the study was released in 2011, Moniz spoke about it at a press conference at the Brookings Institution in Washington, which had convened a task force to explore LNG exports just a month earlier. Task force members included two staff members from Moniz’s MIT group. After leaving his White House job in 2013, Obama climate advisor Jason Bordoff also joined the Brookings task force. In his statement to the Center, Moniz’s spokesman said the study has “stood the test of time.” The spokesman emphasized Moniz’s support for an Obama-era rule that sought to rein in leaks of methane from oil and gas sites — a regulation the Trump administration says it plans to weaken. The MIT study was cited in a slew of other reports, including one from an Energy Department committee in 2011 that concluded shale gas would “provide economic and environmental benefits” as well as strengthen national security. Chairing the committee was John Deutch, a former CIA director and then-board member of Cheniere, a Houston-based company that later became the first to export LNG. As it happened, Deutch was also one of 30 MIT researchers who co-authored Moniz’s natural-gas study. Deutch was among six of the seven Energy Department committee members with potential conflicts of interest. Another member, Pulitzer Prize-winning author Daniel Yergin, went on to publish several studies in favor of LNG and crude-oil exports as vice chairman of IHS Markit, a leading industry consultancy in Cambridge, Massachusetts. Yergin sat on the advisory board of Moniz’s MIT think tank; Moniz was a private consultant for IHS Markit. Deutch did not respond to requests for comment, but a representative of Yergin’s noted that IHS is “solely responsible” for the contents of its studies, regardless of funding. The studies helped buoy the idea of natural gas as an answer to the planet’s climate woes, even though early research hinted that methane could derail that narrative. A 2018 study sponsored by the Environmental Defense Fund — a green group that has partnered with the oil and gas industry to investigate leaks of the greenhouse gas — has only furthered doubts. Published in the June issue of Science, the study found methane emissions were 60 percent higher than previously estimated. “If natural gas is a bridge fuel,” said Ramón Alvarez, a co-author and associate chief scientist at EDF, “methane leaks is a major structural fault in the integrity of that bridge.” To meet the lofty targets outlined in the Paris agreement, it is widely accepted that countries must reach “zero emissions” by 2050, which means phasing out fossil fuels or developing technologies that make them climate-neutral. Environmentalists argue the expansive buildout of natural-gas infrastructure ensures the fuel’s future for decades, jeopardizing the world’s chances of avoiding catastrophic warming. At present, renewable energy sources make up less than one-fifth of U.S. power generation. Despite these concerns, LNG’s popularity has only grown. An official day celebrating natural gas was held during the 2016 G20 summit in Beijing, where world leaders were urged to “differentiate natural gas from other fossil fuels with effective and favourable policies.” Amid Trump’s escalating trade war, Chinese officials enacted lower retaliatory tariffs on imports of American LNG than they originally threatened — signifying how crucial the fuel is to China’s growth as it curbs its reliance on coal. Under President Barack Obama, the U.S. took an “all of the above” approach to energy that emphasized drilling alongside renewable sources like wind and solar. 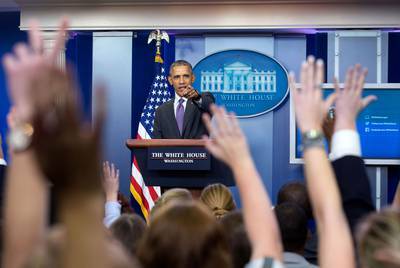 Obama is shown here at an April 28, 2016 press conference. Amanda Lucidon/The White House ‘Level the playing field’ During a July press conference in England with British Prime Minister Theresa May, Trump struck an upbeat tone. “We've become an oil exporter, which would not have happened under the past regime or a new regime if it weren't us,” he declared. In fact, America did begin exporting large volumes of crude oil under Obama. He approved a last-minute budget deal to avert a government shutdown in 2015, which also removed restrictions on crude sales for the first time in 40 years. However, the country still imports more crude than it exports — a trend experts believe will continue. Congress had enacted restrictions on crude exports as a conservation measure in 1975 following the Arab Oil Embargo, which caused fuel shortages that led to skyrocketing prices at the pump. Under the ban, companies had to refine crude oil into petroleum products such as gasoline or secure special exemptions from the Commerce Department to sell the resource abroad. As was the case with LNG, interest in crude-oil exports soared when fracking took off. With oil production rising steadily in 2012, American Petroleum Institute President Jack Gerard was among the first to suggest the ban be thrown out. Shortly thereafter, crude-oil exports became a priority for the GOP as well as some Democrats in drilling states. But they became an albatross for the Obama White House. Boosting crude oil — which doesn’t have any of LNG’s purported climate benefits — would put the administration at odds with its own climate agenda. So, in October 2015, the White House threatened to veto legislation lifting the ban, urging Congress to focus on “supporting our transition to a low-carbon economy.” Sens. Heidi Heitkamp, D-N.D., and Lisa Murkowski, R-Alaska, responded by mustering congressional support for a provision in that year’s budget bill allowing crude-oil exports. By December 2015, the measure was part of a $1.1 trillion spending plan — veto-proof legislation needed to keep the federal government running. In exchange for backing exports, Democrats got five-year extensions on tax credits for wind and solar. “You’re giving one side something forever, and [another] something for a limited time. It didn’t strike us as the best deal,” said Ana Unruh Cohen, managing director of government affairs for the Natural Resources Defense Council, an environmental group. Cohen was an aide to Sen. Edward Markey, D-Mass., when interest in the ban spiked on Capitol Hill. Markey was the deal’s most vocal opponent, calling it a “Trojan horse” for “pumping up Big Oil’s profits.” Climate change was an afterthought in the debate over the ban, Cohen said. Both sides were fixated on how crude-oil exports would affect energy prices, not greenhouse-gas emissions. Experts wrongly predicted exports would amount to “a trickle, not a flood.” And Democrats mistakenly banked on pollution-cutting policies such as the Clean Power Plan — one of several Obama-era regulations being tossed out by Trump — to drive investment in renewable energy. Even though the Obama White House publicly discouraged efforts to undo the ban, it ultimately signed off on the deal. Tyson Slocum, director of the energy program at Public Citizen, a consumer advocacy group, called it a “pathetic compromise” driven by the administration’s pro-export agenda. “The minute the White House staff signaled that they were going to endorse the lifting of the crude oil ban, all of the Democratic opposition to it evaporated,” he said. “Everybody was like, ‘Why would I go to the mat if my president isn’t going to the mat?’” On January 4, 2016, ConocoPhillips — one of 16 companies that collaborated to overturn the ban — became the first to export American crude oil, sending a shipment from the Texas Gulf Coast to a trading hub in southern France. This summer, the U.S. shattered records by exporting 3 million barrels of crude a day, trailing only Saudi Arabia and Iraq. On Jan. 4, 2016, ConocoPhillips became the first company to export U.S. crude oil following the reversal of a 40-year-old ban. 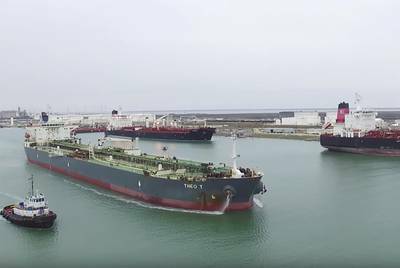 The Theo T is shown exiting the Port of Corpus Christi with an inaugural shipment, headed for Europe. YouTube, Port of Corpus Christi In a written statement, Heitkamp said crude-oil exports have allowed the U.S. to “level the playing field in the global energy market” and made “sure our allies get energy resources from us instead of volatile regions.” Obama representatives did not respond to requests for comment. Moniz was among the first Obama administration officials to publicly question the ban in December 2013. During an industry conference at New York’s Waldorf Astoria hotel, Moniz suggested it was time to rethink the outdated policy. Executives at ExxonMobil, ConocoPhillips and Shell agreed, fueling an industry campaign to cast the ban as a relic of the 1970s. In the interview with the Center and Newsy, Moniz said his remarks reflected “proper policy,” not industry lobbying. Barriers to exports already had been eroding behind the scenes. In September 2013, the Commerce Department issued a confidential ruling allowing Houston-based Peaker Energy to export condensate, a barely processed, ultralight oil hard to distinguish from crude. The agency granted approvals to two more companies in March 2014. The rulings — which didn’t become public knowledge until months after they were issued — triggered speculation by an energy analyst that Commerce was taking a “baby step” toward lifting the ban. It was unclear at the time what differentiated condensate from crude, but the distinction potentially was worth billions of dollars to drillers looking to export oil. At the same time, a flurry of white papers promised crude-oil exports not only would lower energy prices but also give America an edge over energy titans such as Russia. In January 2014, Murkowski sent then-Commerce Secretary Penny Pritzker a letter asking her to weigh in, enclosing a staff report suggesting the agency could “lift the ban on its own.” A separate study from IHS Markit argued that reversing the ban would resolve a dilemma created by the fracking boom, which had flooded the market with a lighter crude that couldn’t be easily processed by most U.S. refineries. Co-authored by Yergin, that report was funded by 20 oil and gas companies. Industry was also marshaling forces to overturn the ban. Producers for American Crude Oil Exports, or PACE, debuted in October 2014 as a coalition of 16 companies dedicated to reversing the “outdated policy in a new era of U.S. energy abundance.” John Hess and ConocoPhillips’ Ryan Lance, whose companies belonged to PACE, appeared with Heitkamp on cable news programs to endorse crude exports. Yergin likened a reversal of the ban to an “economic stimulus that would be paid for by the private sector,” from which “the government would make a lot of money.” Exports have taken drilling to new heights in the Permian Basin. Of PACE’s 16 members, at least 14 were active in the region last year. The basin’s top two producers were PACE companies Pioneer Natural Resources and Occidental Petroleum, which collectively earned more than $2 billion in profits in 2017. The Permian boom is expected to accelerate — worsening air quality and driving up water use in a region prone to drought. In June, IHS Markit predicted a “stunning” bump in crude production by 2023, putting the basin above every member of the Organization of the Petroleum Exporting Countries except Saudi Arabia. In a speech to the United Nations in September, Trump condemned the 15 OPEC members for “ripping off the rest of the world” and said, “The United States stands ready to export our abundant, affordable supply of oil, clean coal and natural gas.” Some of the same PACE companies fund Columbia University’s Center on Global Energy Policy, a think tank founded in 2013 by former Obama energy and climate advisor Jason Bordoff, who has argued in favor of both LNG and crude-oil exports as a way to spur job growth and keep America competitive. Columbia previously housed a similar think tank called the Center for Energy, Marine Transportation and Public Policy (CEMTPP), which was launched in 2000 with $3 million from ExxonMobil and a foundation created by shipping magnate Aristotle Onassis. CEMTPP was headed by a Mobil lawyer before it was dissolved sometime in 2014. Tax filings for its foundation were registered at Mobil’s old campus in Fairfax, Virginia. In an email, a Columbia spokesman said there is no connection between Bordoff’s Center on Global Energy Policy and CEMTPP. “At no point has there been a relationship between the two organizations or their personnel,” the spokesman wrote. 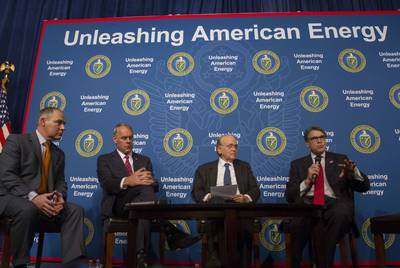 The Trump Administration has pursued what it calls “energy dominance.” Pictured from left to right on June 29, 2017: former U.S. Environmental Protection Agency Administrator Scott Pruitt, Interior Secretary Ryan Zinke, energy expert Daniel Yergin, and Energy Secretary Rick Perry. Simon Edelman/U.S. Department of Energy ExxonMobil also funds Bordoff’s center but is not among its top donors. Of the 48 sponsors listed on the center’s website, at least 29 have direct ties to the oil and gas industry. Donors include foreign investors such as Tokyo Gas Company Ltd., a Japanese utility that recently signed a 20-year contract to import U.S. LNG, and Wall Street firms such as Perella Weinberg Partners, a hedge fund that reported a multimillion-dollar stake in LNG startup Tellurian earlier this year. The center’s advisory board includes Yergin; one current and one former executive from ConocoPhillips; Chinese oil tycoon Fu Chengyu; and Charif Souki, co-founder of LNG companies Cheniere and Tellurian. The board’s industry-heavy makeup has drawn scrutiny from advocacy organizations such as Public Citizen and the Environmental Working Group, which demanded the center disclose its funders in 2015. The center began posting a list of sponsors online earlier this year. Only a handful of donors — among them Bloomberg Philanthropies and ClimateWorks Foundation — appear to be focused on climate change and renewable energy. Funding sources are rarely disclosed in the center’s papers or Bordoff’s numerous op-eds and columns. In 2015, Bordoff promoted a paper supporting crude-oil exports to high-ranking Commerce staffers. Though the report was among the few to conclude that exporting crude would likely increase carbon emissions, it argued that climate change would be better addressed in other ways. The center declined to make Bordoff available for an interview. The Columbia spokesman wrote that the center’s work has focused on “how the reduction of fossil fuel use and the growth of clean energy sources are necessary to address the urgent challenge of climate change. … The suggestion that some contributions from commercial entities or any other source have affected the independence of [the center’s] policy analysis is false.” Bordoff has been a frequent critic of the Trump administration for its rollbacks of environmental regulations. “Neutering the Clean Power Plan is a major step backward,” he wrote in The New York Times in August. But he’s continued to advocate for LNG exports, aligning himself with free-market diehards like Perry. At the World Gas Conference in June, both men argued for greater U.S. investment to keep exports flowing — perpetuating what Perry called an “astonishing energy miracle.” Perry closed his keynote speech by saying, “We must honor the right of every nation to responsibly use every fuel at its disposal. This includes renewables, this includes fossil fuels, and yes, it includes the cleanest fossil fuel and one of the most abundant energy sources on the planet, and that’s natural gas.” For all their bluster, Perry and other Trump officials are merely capitalizing on choices made years earlier that breathed new life into “vested fossil-fuel interests,” said Slocum, of Public Citizen. “That’s what folks in the Obama administration never really understood — that the decision they were making has implications for one or two generations,” he said. “That's the shortsightedness of this entire hysteria to promote exports.” This article is part of a collaboration between the Center for Public Integrity, The Texas Tribune, The Associated Press and Newsy. Disclosure: ExxonMobil, BP America and the Environmental Defense Fund have been financial supporters of The Texas Tribune, a nonprofit, nonpartisan news organization that is funded in part by donations from members, foundations and corporate sponsors. Financial supporters play no role in the Tribune's journalism. Find a complete list of them here. Read related Tribune coverage As oil and gas exports surge, West Texas becomes the world’s “extraction colony” Texas oil industry experts say Mexico's plan to halt fuel imports won't have immediate impact Faced with failure, state to propose new plan to protect West Texas lizard "How Washington unleashed fossil-fuel exports and sold out on climate" was first published at by The Texas Tribune, a nonprofit, nonpartisan media organization that informs Texans — and engages with them — about public policy, politics, government and statewide issues. Link back to the original article, which is located at https://www.texastribune.org/2018/10/16/how-washington-unleashed-fossil-fuel-exports-and-sold-out-climate/.